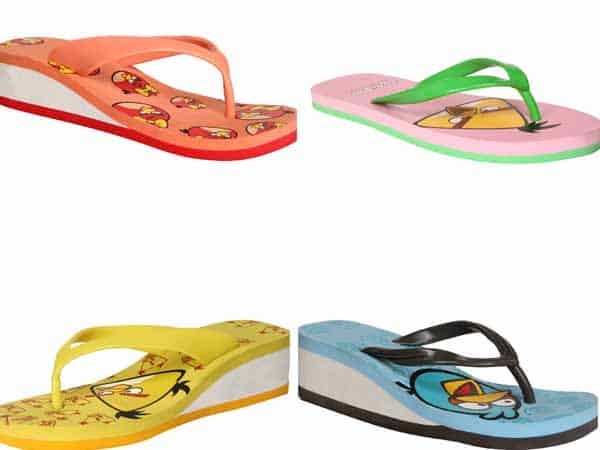 India’s largest manufacturer and retailer of footwear, Bata India, has introduced a new collection of Angry Birds merchandise, offering school shoes, casual shoes and accessories for children and teenagers. The design’s are trendy, comfortable and the motifs has been taken from angry birds – red, blue, black, boomerang etc. This is one of the latest fashion trends for footwear. The collection is an assortment of rubber thongs, slippers, eva (Injection) range along with school shoes and socks for the age bracket of 2 years to teens. This range offers a colour splash in casual canvas shoes for kids and teenagers. One can also look out for funky accessories as well as bags both casual and for school. You can accessorise yourself with all the things that you need by purchasing them from the stores they are available. Commenting on the launch, Mr. Rajeev Gopalakrishnan, Group Managing Director, Bata India Limited said, “With this association, we look forward to further strengthen relations with our younger audience. With a variety of products for pre-teens and teens, we are very excited to launch the ‘Angry Birds collection’ that will make every purchase made by the customer worthwhile for them. With increasing popularity of Angry Birds amongst the youth, these attractive styles and designs are surely to entice the younger customers.” Priced between Rs.299 to Rs. 999, the collection is available in bright and vibrant colours across at all Bata stores. Bata holds a unique place in the hearts of Indians for more than 75 years. Bata has redefined the modern footwear industry in India. It has established a leadership position in the industry and is one of the most trusted name in branded footwear. So, grab your shoe wear and mark a new fashion trend with the unique collection. You are sure to gather compliments for it.